Did a uterine infection or exposure to toxic chemicals cause what appears to be a genetic defect in your litter; cleft palate, heart defects, or skeletal anomalies? 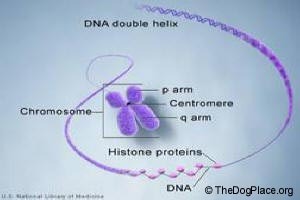 Genes are the factors which determine the inheritance of characteristics from parents. Every trait that is present in a dog, from his personality, to structure, and to physiologic functioning, has its basis in genetics. Health disorders can be produced in a breeding program which range from mild to severe. A breeder must prioritize and work to eliminate the problems which cause the most pain and suffering. Has a genetic origin of the problem been verified? What is the incidence of this problem? What is the mode of inheritance? 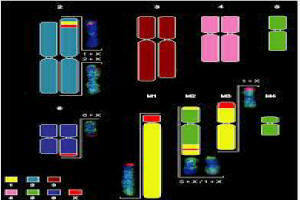 How can recessive carriers be identified? To verify a genetic basis for a disorder, other causative factors for a condition must be ruled out. While in the uterus, were the puppies exposed to drugs, chemicals or infectious bacteria or viruses? Did uterine crowding or lack of amniotic fluid cause a physical deformity? Overdoses of vitamins and minerals in the diet have been proven to cause a variety of problems, such as cleft palate, heart defects and skeletal anomalies. Seizures have a wide variety of causes, including infection, low blood sugar, calcium imbalances, and birth trauma. Most disorders present at birth are isolated cases with little hereditary significance. However, if the problem appears again when one of the parents is bred to a different mate, or if the problem surfaces again in succeeding generations, then a genetic linkage must be considered. The unthinking assumption that all health and birth abnormalities are genetic in origin can be dangerous. Many veterinarians will take the easy route of blaming all health concerns solely on genetics. This is unfair and unfortunate. Irreplaceable bloodlines and the pride and morale of a breeder can be damaged by thoughtless dismissal of causative factors for disease. Are Shared Traits In A Litter Actually Shared Genetics? A trait which occurs among members of the same family can be due to shared genes, shared environment, or a combination of genes and environment. Relatives are often exposed to the same environmental factors, such as climate, diet, stress, vaccinations, and toxic plants or chemicals. Research in every situation is necessary. For some health problems, the causes remain undetermined. Weigh the evidence before blaming parents and related bloodlines. However, it is imperative to be realistic, and not blame all congenital disorders on environmental causes. Incidence of a genetic problem in a certain breed may be difficult to accurately assess. Information in health registries is limited, as information sent to registries is usually on a voluntary basis. Sometimes breeders only submit their "good" results to the registries and databases, or they may submit no results and use their information only for their personal breeding program. Although information through registries may be limited, it is surely much better than no information at all. Information from registries can be invaluable to new breeders. Knowledge of the extended pedigrees of breeding stock is necessary and should be kept on record. Notate both depth of pedigree (looking back at ancestors) as well as breadth of pedigree (looking at siblings and cousins in the pedigree). Keep in touch with your puppy buyers to know what health problems you may be producing. The mode of inheritance of a condition affects a breeding plan. Dominant traits are always evident, and easily eliminated by excluding affected animals from breeding plans. Recessive traits can lie undetected for generations. Unfortunately, the genes responsible for many genetic problems are recessive. Some diseases are produced through the interaction of several different genes. This type of disease is labeled polygenic, meaning that it requires multiple gene combinations for expression. Recently, there have been great strides in identifying genetic markers and the carriers for some diseases. Genetic markers have been found for approximately 15 different breed-specific diseases, including PRA, Von Willebrand's Disease, and copper toxicosis. However, this is a relatively small amount compared to the number of diseases which exist. An exciting prospect for the future is gene splicing and recombinant technology, which could eliminate many genetic problems. Further complicating the picture is the fact that some disorders which appear later in life may be acquired rather than genetic in origin. Some cardiac diseases, musculoskeletal problems, epilepsy, cancers, autoimmune diseases and eye disorders can be caused by injury, toxins, or infection during the course of the dog's lifetime. Most breeders are in agreement that affected dogs should not be bred. For many health problems, no genetic test to determine carrier status currently exists. In the absence of a specific genetic test, identification of carrier status can be difficult to determine. If a dog produces a certain health condition in progeny with mates of different bloodlines, and environmental factors have been ruled out, a carrier status may be presumed. If carriers for recessive traits are identified, the next question is, should they be eliminated from a breeding population? When dealing with common breeds involving large, diverse gene pools, identified carriers can be eliminated with small risk of adversely narrowing the gene pool. In breeds with small gene pools, as is the case with many pure breeds, elimination of identified carriers may not be the best strategy, as genetic diversity would become dangerously compromised. A genetic bottleneck can also occur when culling severely a trait that is widespread throughout a breed. One plan used by many breeders is to breed identified carriers only to individuals who test clear of a condition. This would eliminate producing affected individuals, while maintaining the genetic diversity of the breed. The idea here is to gradually decrease the percentage of carrier dogs via selection down through the generations. This approach requires honesty on the part of the breeders and a willingness to work together. Asking breeders to eliminate suspected carrier dogs is asking them to throw the baby out with the bathwater. Working with them to help reduce the incidence of heritable health problems may require more patience and tolerance, but will ultimately improve the health status of your breed. And that is a goal we can all agree upon. False certifications blind breeders to visible health defects they could fix! * None of the statements contained herein as regards human or animal health have been evaluated by the FDA. Information is provided for educational purposes only. 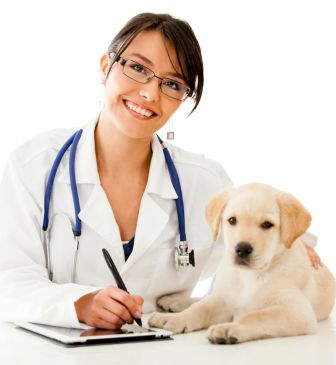 We are required to advise you to always check with a licensed veterinarian or medical doctor. Information or products offered are not intended to diagnose, treat, cure, or prevent any illness, disease, or condition, whether animal or human. This disclaimer is due to FDA restrictions designed to protect you, the consumer. It does NOT however, protect you from malpractice, prescription drugs, or vaccines.